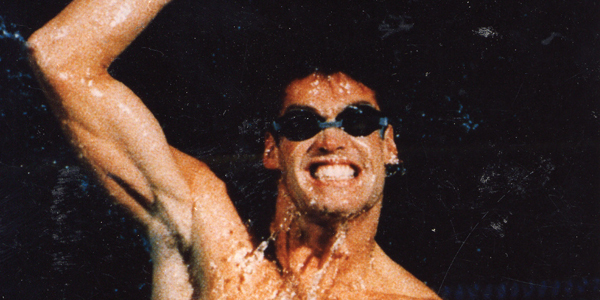 Mark Tewksbury is the star athlete who burst out of the water at the Barcelona Olympics; an Olympic Champion with gold, silver and bronze medals in hand, inductions into three major Halls of Fame, and a cover appearance on TIME magazine. He grew into the leader who traveled the world with the International Olympic Committee, was on the executive of Toronto’s Olympic bid for 2008, and took a difficult and public stand against the IOC for athletes’ rights and ethics in sport. Tewksbury has been a champion for a number of important causes. He currently sits on the National Board of Special Olympics, and for his leadership and active humanitarianism, he was recognized by the University of Western Ontario and the University of Calgary with honorary doctorate of laws. A highly sought after speaker, beyond the podium Mark has hosted television shows, authored three books and performed workshops around the world. He is a popular media commentator, was the Master of Ceremonies at the Dalai Lama’s Canadian appearances in 2007 and 2009, and in 2008 was invited by the Government of France to address human rights at the United Nations in New York City. Fast-forward to the present, and you’ll notice this uncommonly humble man is the picture of vibrancy. He seems at peace, living harmoniously with an illustrious career. And, as destiny would have it, he’s back on the Olympic team; recently appointed one of Canada’s most prominent positions as the chef de mission for the 2012 Olympic games. In 1998, you made a decision to fully accept and honour parts of yourself rather than hiding or lying about them. You shared your truth – you were the first Canadian Olympian to “come out” and tell the world that you’re gay – even when you knew it would create conflict and tension, and possibly ostracize you. Can you talk a bit about why you made that brave decision when you did, and how you found the courage to do it? From my perspective it wasn’t really that brave or courageous – it was a necessity. I had to survive, and I was starting to feel like I was suffocating. I just couldn’t take any more pretending to be something I wasn’t, or not knowing how to be. But if you’re looking from the outside in, where do you start, in terms of how to be? The surprising thing about that experience was it was the beginning of a whole other journey, and it took many years for it to become fully integrated. I was living an open life but it was a private life, not a public life. I realized that part of my career is based on the personality of being Mark Tewksbury, and there’s a persona attached to that but it’s also me. And, I couldn’t separate the two anymore. I just had to go for it. Did any love or recognition gained from playing a role seem a little empty or counterfeit? Yes. Definitely. I don’t think I even realized how unhappy I was in my life because I was so successful.” And, that’s an interesting thing – I’ve never been as unhappy as I was the year after I won the Olympics. When I thought it was going to be my greatest achievement – it felt so compromised on a spirit and soul level. That’s powerful. Hearing you say that makes me think of authentic success, and what that means to you? Well I guess it means success on your own terms. So you’re not finding yourself in a position in life where maybe you thought you wanted to be but you had to compromise all kinds of things, parts of who you are, in order to get there. I think authenticity, mostly, is being able to be who you are in any situation, and I think if you can do this, then you are really successful. I’ve lived a period of my life where I had to have silos: athlete Mark here, gay Mark here. Life doesn’t work well like that. When did you realize self-acceptance is more important than having to act in ways you feel will be acceptable to others? I struggle with that to this day. I believe in achievement and I believe in leadership and those kinds of things. It’s not like those things are bad. You just have to be really careful with what you’re pursuing and why. I just don’t want to ever get to that empty win again, if you will. I’ve come to appreciate that all of these attributes of achievements are really positive things it’s just how you apply them, and what you apply them to. What makes you happy, really? I’m still pursuing more material wealth, and some of those external things in life but while I’m doing that, I fully understand that I have everything I need. I feel very happy, and joyful, and I’m glad I can recognize that, as it’s happening. I think that’s a breakthrough. Then what you achieve outside of yourself becomes a bonus and I think I was wired for the reverse most of my life…if I get that “X” thing, then I’ll be happy. That may sound cliché but it’s profound when you truly get it on a fundamental level. I’m in such a good place now and I actually think I’ll be hugely successful because of that, ironically. It kind of flips itself. So what would you say to someone who isn’t living their truth, and is struggling to do so because of a fear? I think if you’re living a life that is overrun by fear, you’re really not living in a very good place. It usually means you’re afraid of change but by hanging on to what you have, you just stay in a place of fear and worry so why wouldn’t you want to change it? It’s such a funny cycle. The human mind is so fascinating and so complicated. So much of this happens on a subconscious level and people just aren’t even aware of what’s going on. It’s not their fault. It just is. I think certain things in life force you to wake up, and for sure that’s where growing up gay helped me. It was seen as a liability, like it wasn’t a great thing, right? But it gave me so many “jolts” early in life and it forced me to go against conventional thinking at that time, which made me stronger. And it helped you to trust yourself? Eventually trust myself. Again these concepts don’t happen over night. It’s falling down, feeling hurt, confused, lost and finally resorting to, “Okay, I had better start listening to myself”. It’s not as simple as I woke up one day and I decided I was going to come out. It was painful, arduous, and brutal at times. But that’s the journey of life and it’s actually the really rewarding part. When people are feeling afraid, it’s usually because they’re afraid of where this (decision) is going to take them. It’s the unknown. Maybe the first step to breaking the grip of fear and hesitancy is when you feel that this life counts, and that you count? And, I love that you said adversity is rewarding. A good reminder that the hard times we go through help us grow, and we need to embrace the change, not run from it. Why do you think you’ve been able to rise above the social stigma, and be given so many amazing opportunities? Authenticity gets a lot of credit there. I was raised great. I came from working class, and I understand the value of working for things and you have to put the time in. I had a happy childhood, other than my being gay, which has nothing to do with my parents or my circumstance. We weren’t rich, we were the family that got the Atari three years after it came out and I envied the kids that got the brand new jeans but somehow through it all, my brother, sister and I were never jealous of each other and we always learned to share and be good to each other. It gave us a really good base and somehow it has translated into me being a decent person. I think being a good person and being who you are, people are then willing to go for the ride and give you the benefit of the doubt. They’re a little bit forgiving, and not as harsh – they enjoy cheering you on. I really lay it all out there and when it’s your truth, it’s really powerful, and it’s hard for people to deny it. It was not easy to get there for sure but now I don’t even think about it, which is the amazing part. There were years, I call it kind of my self-help hole, and I mean that kind of lovingly, but it was a time where I was just searching, and digging deep, and questioning – trying to be true to myself but not really understanding what that even meant. Those were long years, and I’d say those were the years after I came out. Because coming out was supposed to be this, you know, metamorphosis, which on one hand it was but it doesn’t change everything. It just means now people know but now I have to figure out how to maneuver through life in that different space myself. Do you think it was different levels of acceptance and growth? Well, I think for me it was different levels of growth. It’s like something shedding its cocoon. It doesn’t happen immediately. It’s a process. So the question “who am I?” is not a one-time assignment? Who was your greatest influence personally and professionally? I’d have to say probably Debbie Muir my swimming coach, and now my business partner (Great Traits Inc.). We’ve remained very close friends and she’s been a very influential person in my life over the past 20 years. Our business is based on a totally authentic experience – what we did together, to make huge improvements in my life. It’s also powerful and a really neat way that my public speaking has translated into more of a professional development business and curriculum. And authenticity is at its base. I’d like to end on the topic of your legacy – which I realize is in the making – but based on what you know today, how do you want to be remembered?